Department of Clinical Microbiology and Infectious Diseases, Haseki Training and Research Hospital, Adnan Adivar Street, Aksaray, 34300, Istanbul, Turkey. Address correspondence and reprints request to: Kadriye Kart Yasar, Department of Clinical Microbiology and Infectious Diseases, Haseki Training and Research Hospital, Adnan Adivar Street, Aksaray, 34300, Istanbul, Turkey. Yasar KK, Pehlivanogulo F, Gursoy S, Sengoz G.Tricuspid Endocarditis and Septic Pulmonary Embolism in an Intravenous Drug User with advanced HIV Infection. Oman Med J 2011 Sept; 26(5):365-367. Cardiac complications are becoming increasingly important in patients with HIV infection. Right-sided endocarditis are more common in intravenous drug users (IVDU) with HIV infection. Some studies have pointed out that the clinical outcome of such patients depends on the affected valve referred to the responsible agent rather than the HIV serostatus. However, severe immunosupression and low CD4 count are associated with increased risk of death. This report presents a case of isolated tricuspid valve endocarditis with advanced HIV infection who was also an IVDU. Keywords: Daptomycin; HIV infection; Infective endocarditis; Intravenous drug user; Right-sided endocarditis; Tricuspid valve. Infective endocarditis (IE) is a life-threatening infectious disease of endocardial surfaces. The diagnosis is based on the combination of fever, presence of a vegetation on echocardiography and positive blood cultures.1,2 IE is still associated with high mortality and morbidity rates despite advances in therapeutic and diagnostic procedures. Intravenous drug users (IVDUs) carry increased risk for IE, especially right-sided IE.3 HIV infection is a predisposing factor for IE in IVDU.4 Patients with symptomatic HIV infection or advanced diseases exhibit greater mortality risk of IE.4,5 We hereby report a case of isolated tricuspid endocarditis comorbid with advanced HIV infection in an IVDU. A 35-year-old male presented at the emergency department of a hospital with fever and drowsiness. He resides in Turkey as an asylum seeker. He had a history of right ankle fracture 25 days before presentation. His medical history revealed that he was an intravenous drug user. Serological results for HIV and HCV infection were positive and the deterioration in his clinical status lead to his transfer to our clinic, Haseki Training and Research Hospital. Before admission to our hospital, he had received ceftriaxone, clarithromycine and trimethoprim-sulfamethoxazole empirically. Physical examination on admission revealed fever (38.9ºC), altered sensorium, cachexy, diffuse petechial rash, hepatosplenomegaly, dispnea and bilateral diffuse pulmonary crackles. Laboratory tests and urinanalysis revealed; leukocytosis (19.500/mm3), profound anemia (hemoglobin: 6.8 mg/dl, hematocrit: 19.2%), thrombocytopenia (67.000/mm3), elevated ALT and AST (59 and 114 IU/L respectively), hyponatremia (128 mmol/L), hypoalbuminemia (1.9 g/dl), elevated creatinine (1.9 mg/dl), proteinuria, hematuria and urinary casts. C-reactive protein, erythrocyte sedimentation rate, HIV RNA and CD4 counts were found to be 15 mg/L (30-folds), 98 mm/h, 9.220.000 copies/ml and 99 cell/mm3, respectively. Therapy was modified to ceftriaxone (2 × 1 gr), ciprofloxacine (2 × 400 mg) and daptomycin (1 × 8 mg/kg), due to renal and hepatic disorder after echocardiogram, which revealed a surge in vegetation (16 × 18 mm) on tricuspid valve, (Fig. 1). Other valves were intact and transesophageal echocardiography could not be performed due to worsening general condition of the patient. Although, he had received antibiotic treatment before admission to our hospital, six sets of blood cultures (including two bottles in each set) were placed into the Bactec® hemoculture device during admission and treatment; however, no reproduction occurred. High resolution computed tomography of lungs showed diffuse patchy infiltrates and cavitary lesions consistent with septic pulmonary embolism, (Fig. 2). Hepatomegaly accompanied by parenchymal disorder, splenomegaly and expansion of portal vein were detected in portal system doppler ultrasound. Cardiovascular surgeons planned an intervention in elective conditions due to renal impairment and liver decompensation that resulted from HIV-HCV co-infection. On the sixth day of therapy, his clinical conditions partially improved and fever disappeared. However on day 12, blood urea and creatinine levels increased and ascites occurred. The nephrologists assessed "progressive nephropathy" via >3 gr/day proteinuria and interpreted in favor of HIV nephropathy or focal segmentary glomerulosclerosis known as an immunological response to IE. Despite replacement therapy, urine output decreased while progressive ascites and pleurisy appeared. The patient died due to anasarka edema and multi-organ failure on the 15th day of hospitalization. 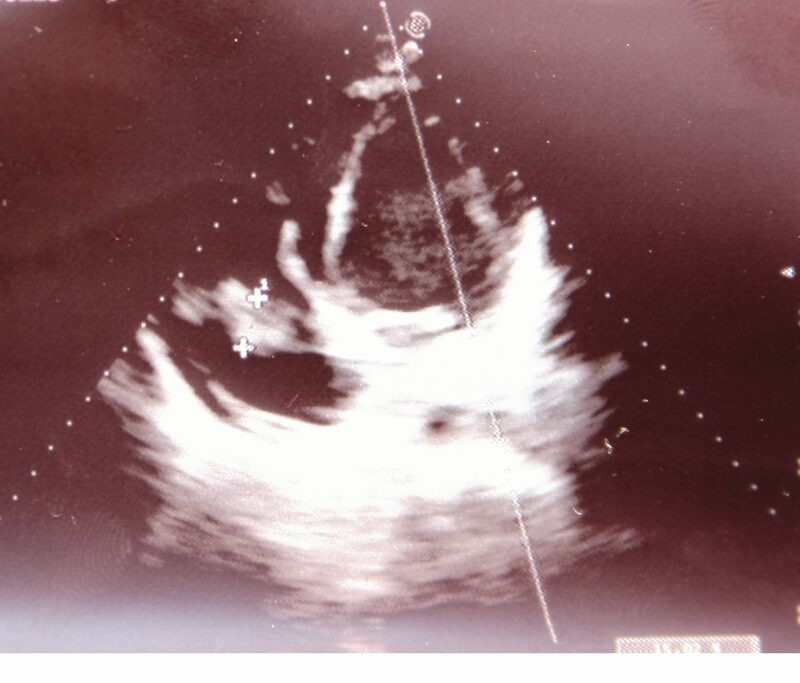 Figure 1: A big vegetation (16 × 18 mm) on the anterior cuspid of tricuspid valve in transthoracic echocardiogram. 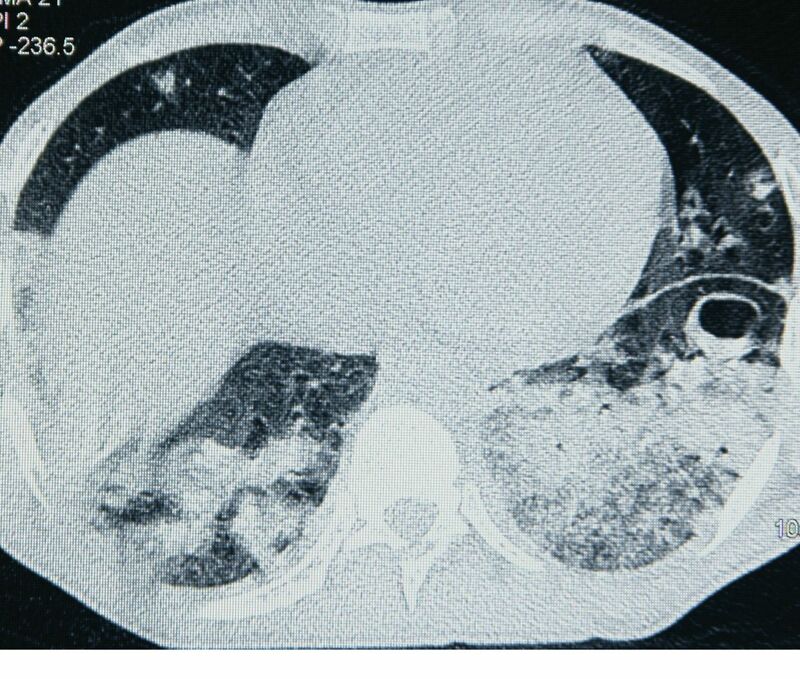 Figure 2: Diffuse pneumonic infiltration, bilaterally pleurisy, cavitary lesions in HRCT were associated with septic pulmonary embolism. Infective endocarditis (IE) in HIV-infected patients, mostly IVDUs, is more commonly localized to the right side of the heart when compared with a varying rate of left-side involvement. It was reported that tricuspid valve involvement alone was the most frequent type among 100 HIV positive patients with IE.3 Tricuspid endocarditis usually results from intravenous seeding of the valve from recurrent episodes of bacteremia. Repeated injections of particular matters result in valve damage, platelet-fibrin deposition, thrombus formation, predisposition to adherence by bacteria and the development of IE.3 For these reasons; IVDUs are susceptible to IE. Our patient was an IVDU and he did not know when he first contracted HIV or HCV. He was unemployed and had been living as an asylum seeker in poor living conditions and drug addiction for approximately three years in Turkey. According to his declaration, this was the first attack of IE. In a prospective study, IE incidence was found to be higher in HIV positive IVDUs, especially patients with advanced immunosupression than HIV negative patients.4 The patient in the current report was co-infected with advanced HIV infection accompanied by a clinical expression of hepatic decompensation likely due to the HCV infection. Low CD4 count, high HIV RNA levels and cachectic view may suggest advanced HIV infection. While, altered sensorium, hepatosplenomegaly, low platelet count, hyponatremia, hypoalbuminemia and ascites may be considered as signs and symptoms of hepatic decompensation in the course of IE accompanied by HIV-HCV coinfection. It is likely that the elevated creatinine levels were associated with hepato-renal syndrome. Therefore, advanced immunosupresion and hepato-renal failure may have been predisposing factors for IE, which lead to his death. Relevant IE series revealed that the leading mortality factors for IE were multi-organ failure and heart failure. In these studies; multivalvular involvement, vegetation size >15 mm, and serum creatinine ≥2 mg/dl, as well as previous history of IE, altered sensorium, mobil vegetation, age (>30 years old), septic condition and hemodynamic impairement were found to be the most important predictors of mortality.3,9-12 The current case exhibited most of these features, including; altered sensorium, hemodynamic impairment, large sized vegetation, and elevated serum creatinine levels; and were thus considered to be prognostic factors of death in this case. Surgical indications in tricuspid endocarditis include continuous sepsis despite appropriate antibiotic coverage, heart failure due to tricuspid insufficiency, and multiple pulmonary emboli.10 Our patient exhibited findings of multiple pulmonary septic emboli and heart failure; however, his general condition was not relevant due to hepatic and renal decompensation with respect to cardiovascular surgery. The patient could have been saved if cardiac intervention was performed when his general course had improved. Therefore, it is fair to conclude that surgical option must be enforced at the earliest stage in such cases. Positive blood culture tests are frequenly associated with right-sided IE, while negative blood culture tests range between 10-50% of all IE.3,7,11,13 In IE with negative blood culture, the most common etiological factors are; previous antibiotic therapy, lack of optimal conventional culture techniques and systemic investigation for fastidious agents.13 In our laboratory, BACTEC® automated systems are used as the most advanced system in analyzing blood culture for fifteen years; however, some fastidious microorganisms may be responsible for IE. Nevertheless, repeated blood cultures were sterile in this case and there was a broad spectrum antibiotic usage for four days before blood culture process. Therefore, previous antibiotic usage was considered to be the most probable reason for the negative blood culture. Classical empirical treatment including glycopeptides or aminoglycosides could not be administered in this case due to renal and hepatic impairment; ceftriaxone, ciprofloxacin and daptomycin were administered instead. Tricuspid valve endocarditis is more common in IVDUs, especially when accompanied with HIV infection. Mortality is not usually associated with HIV infection in such cases. However, it is important to note that advanced HIV disease, hemodynamic impairement, low CD4 count and renal disorders may be predisposing factors for mortality. In such cases, it could be life-saving to enforce the isolation of the responsible agent and to provide the application of surgical intervention at the earliest possible stage. 1. Durack DT, Lukes AS, Bright DK; Duke Endocarditis Service. New criteria for diagnosis of infective endocarditis: utilization of specific echocardiographic findings. Am J Med 1994Mar;96(3):200-209. 2. Li JS, Sexton DJ, Mick N, Nettles R, Fowler VG Jr, Ryan T, et al. Proposed modifications to the Duke criteria for the diagnosis of infective endocarditis. Clin Infect Dis 2000 Apr;30(4):633-638. 3. De Rosa FG, Cicalini S, Canta F, Audagnotto S, Cecchi E, Di Perri G. Infective endocarditis in intravenous drug users from Italy: the increasing importance in HIV-infected patients. Infection 2007 Jun;35(3):154-160. 4. Wilson LE, Thomas DL, Astemborski J, Freedman TL, Vlahov D. Prospective study of infective endocarditis among injection drug users. J Infect Dis 2002 Jun;185(12):1761-1766. 5. Cicalini S, Forcina G, De Rosa FG. Infective endocarditis in patients with human immunodeficiency virus infection. J Infect 2001 May;42(4):267-271. 6. Murdoch DR, Corey GR, Hoen B, Miró JM, Fowler VG Jr, Bayer AS, et al; International Collaboration on Endocarditis-Prospective Cohort Study (ICE-PCS) Investigators. Clinical presentation, etiology, and outcome of infective endocarditis in the 21st century: the International Collaboration on Endocarditis-Prospective Cohort Study. Arch Intern Med 2009 Mar;169(5):463-473. 7. Hoen B, Alla F, Selton-Suty C, Béguinot I, Bouvet A, Briançon S, et al; Association pour l'Etude et la Prévention de l'Endocardite Infectieuse (AEPEI) Study Group. Changing profile of infective endocarditis: results of a 1-year survey in France. JAMA 2002 Jul;288(1):75-81. 8. Cabell CH, Jollis JG, Peterson GE, Corey GR, Anderson DJ, Sexton DJ, et al. Changing patient characteristics and the effect on mortality in endocarditis. Arch Intern Med 2002 Jan;162(1):90-94. 9. Erbay AR, Erbay A, Canga A, Keskin G, Sen N, Atak R, et al. Risk factors for in-hospital mortality in infective endocarditis: five years’ experience at a tertiary care hospital in Turkey. J Heart Valve Dis 2010 Mar;19(2):216-224. 10. Valencia E, Miró JM. Endocarditis in the setting of HIV infection. AIDS Rev 2004 Apr-Jun;6(2):97-106. 11. Leblebicioglu H, Yilmaz H, Tasova Y, Alp E, Saba R, Caylan R, et al. Characteristics and analysis of risk factors for mortality in infective endocarditis. Eur J Epidemiol 2006;21(1):25-31. 12. Rostagno C, Rosso G, Puggelli F, Gelsomino S, Braconi L, Montesi GF, et al. Active infective endocarditis: Clinical characteristics and factors related to hospital mortality. Cardiol J 2010;17(6):566-573. 13. Letaief A, Boughzala E, Kaabia N, Ernez S, Abid F, Ben Chaabane T, et al. Epidemiology of infective endocarditis in Tunisia: a 10-year multicenter retrospective study. Int J Infect Dis 2007 Sep;11(5):430-433.